Be the first to share your favorite memory, photo or story of Adele. This memorial page is dedicated for family, friends and future generations to celebrate the life of their loved one. 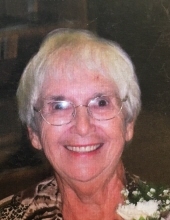 Adele “Dolly” (Benoit) Tippett, 91, of Westfield passed away peacefully on February 2, 2019 surrounded by the love of her family. Born in Ludlow she was the daughter of the late Delor and Helen (Shyloski) Benoit. Dolly was a faithful communicant of the former St.John the Baptist Parish in Ludlow and was past president of the American Legion Post 277 in Indian Orchard, she belonged to the former St. Mary’s Church Women's Club and Golden Agers both in East Springfield, Former Girl Scout Leader and a proud member of the Apostolate of the Suffering. Dolly also was the Park Manager for the Rainbow Village R.V. Park in Zephyr Hill, Florida and was the Mother of the Red Hat Society there. Dolly was the beloved wife of the late Edward Tippett, who sadly predeceased her in 1996; a loving mother to her devoted daughter Kathy Bixby of Westfield, Sister Susan Tippett of the Felicians of Enfield, and her beloved niece Joanne Tippett of Springfield, whom she loved dearly like a daughter; Dolly was a loving Grandmother to Amy Thomas of Westfield her husband Donald, her Great Grandboys Dakota & Austin; her Grandson James Bixby of Granville his wife Tiffany and her Great Grandchildren Cailey, Paige, Madison, James, and Michael; Dolly is survived by her brother in law Larry Deraleau and sister in law Virginia Tippett, many nieces and nephews along with many loving extended family members and dear friends. Funeral services for Adele will be held on Monday, February 11, 2019 from the Ludlow Funeral Home. Visiting hours are Monday morning from 10:00am-12:00pm with a Chapel service at the funeral home beginning at noon with Monsignor Homer Gosselin presiding. Adele’s burial will follow the service in St. Aloysius Cemetery. In lieu of flowers please make donations in Adele’s name to: The Felician Order in Enfield, CT.
To send flowers or a remembrance gift to the family of Adele "Dolly" (Benoit) Tippett, please visit our Tribute Store. "Email Address" would like to share the life celebration of Adele "Dolly" (Benoit) Tippett. Click on the "link" to go to share a favorite memory or leave a condolence message for the family.